Based on Jacques Louis-David’s iconic 1801 painting of Napoleon crossing the Alps, Smith honours Nelly Duff Gallery’s own journey to Paris Urban Art Fair, presenting his own unique interpretation of one of France’s most notorious leaders combined with text from one of Britain’s best-known figures, Lord Byron. And thank’d him for a throne! For this 2019 edition, created exclusively for Nelly Duff’s exhibit with Urban Art Fair, the words of Bryon’s infamous ‘Ode to Napoleon’ adorn each carefully selected pantone chip to replicate David’s original painting. Each figure respectively commands a mixed reaction to their reputations, both men of great passion and undeniable leaders in their fields, both have been condemned for their gaping flaws; being fabulously egotistical, greedy and vain. David, a revolutionary and admirer of Napoleon created his 1801 artwork to flatter the ever-growing ego of Napoleon, and to convey him as a true and powerful leader. Conversely, Byron’s lengthy and condemning verse written upon Napoleon’s exile tears down his carefully constructed persona. In a time where political figures rely on well-chosen photo opportunities and overly-curated social media profiles to convey their propriety, Smith’s immense edition contextualises one of the world’s most recognisable personalities within his own contemporary and incredibly slick style. In dissolving the sharp features and details of David’s original painting, while retaining the red, white and blue of the revolutionary Tricolore, Smith visualises the hypocrisies of not only Napoleon, but also contemporary political leaders that hide behind bravado and vanity in the public eye. ‘Napoleon 2019’ will be available to purchase in person only at our stand at Urban Art Fair 2019, and will release online and in store to the general public from 6pm GMT Sunday April 14th. You can purchase this print HERE. Nick was recently invited by poet Kathryn Carter to collaborate his artwork with her Haiku prose. You can see the product of the collaboration in the 3 works below which have been published in the Haiku Times. Nick presents his latest print edition inspired by international Air Max day. Measuring 46 x 70cm, this limited edition giclee is printed on Somerset Satin 300gsm paper with a screen printed varnish over the colour blocks. Each print is signed, numbered and embossed. Close up reading of this print celebrates the creators, influencers & milestones of this iconic shoe, over the 29 years of its colourful, air cushioned history. Please note: There are no presales for this print launch. This is an online sale on a first come first serve basis only. Many thanks! Credit to @raygrams for the photography! Nick was invited by The Big Issue charity to design limited edition wrapping paper along with David Shirley, Ben Eine & Pure Evil. Hailing from Scotland himself, Nick was asked by the community in Iona to donate a piece of postcard sized art to help fund the campaign to build a new village hall on the island. The winning bidders will be notified thereafter with instructions to make payment directly to Iona Village hall community trust. Artworks will be despatched once payment has cleared. Postage to a UK address is free, international shipping may incur a small surcharge, usually less than £10 but please enquire for a quote. Smith’s recreation of the shore of Iona is a miniaturised version of his standard sized work, and thus is unique in his body of work. To place a bid for this work click this link to enter Gallery 3. "To celebrate our commitment to natural colour, we partnered with Scottish artist Nick Smith to create some of our favourite malts in his distinctive style; using colour swatches to explore the palette of his subject. This beautiful artwork features a true Macallan classic, The Macallan Rare Cask." 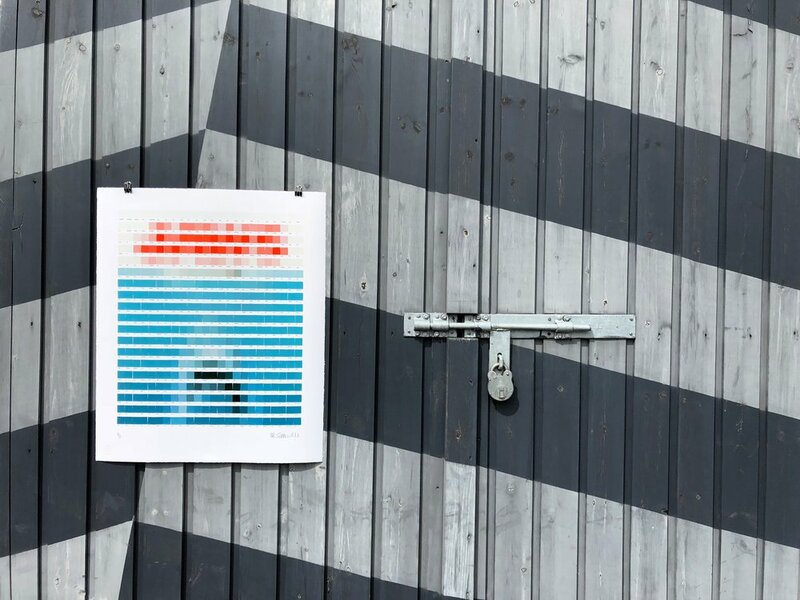 Nick presents his latest print edition inspired by the movie classic, Jaws. The print measures 60 x 72cm and is a limited edition of 50. Printed on Somerset Satin 300gsm paper with a screen printed varnish over the colour blocks, each print is signed, numbered and embossed and sold with a certificate of Authenticity. The text in this print is taken from the chilling scene in the Orca's cabin, where shark hunter Quint, describes the horror of being stranded in the ocean with hundreds of his fellow servicemen, while slowly being picked off by sharks one by one. You can view the scene here. Nick's fourth show with Lawrence Alkin gallery launches this Friday 20th April. If you would like to view and download the catalogue, please click this link to view. Be sure to add your email in the subscribe section of the contacts page to receive the show catalogue. With not long to go until Smith's next show opens at Lawrence Alkin Gallery, we thought we'd whet your appetite with a short introductory trailer. Remember to add your email to the mailing list in the contacts page to be the first to receive the sales catalogue. Smith will be contributing towards FaceValue2. A show which will ‘confront identity changed by the potentially devastating effects of others’. The concept behind FaceValue2 is to use over 25 collaborative artworks to show the effect on one’s identity an outside influence can have, ranging from minimal to near devastating. 25+ artists have donated an artwork knowing it will be handed to an unspecified artist to use as a reference point to take it on a new journey with varying destinations. The result being a collaboration between two artists, producing one coherent work which has had its identity altered by another. The show is located at Jealous Gallery, EC2, London between 9th - 17th March. 100% of the proceeds of the FaceValue2 exhibition are going directly to The Katie Piper Foundation, charity that specialise in helping in the recovery of those of our society have had their own, physical identity altered. 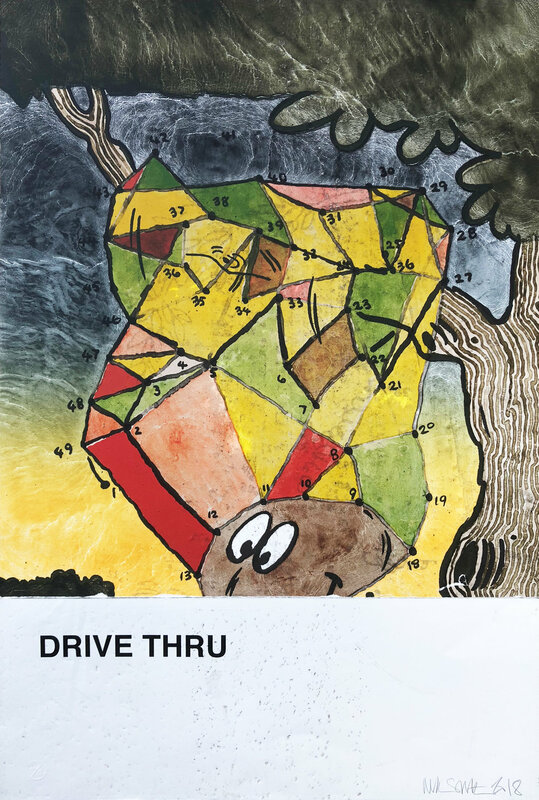 Having used McDonald's as a theme for many years, Jake & Dinos' print was run over by several patrons at a McDonald's Drive Thru. Adorned with new McTire marks, Smith tore the piece in two, then printed the cause of the altered identity in his signature style on the reverse, then stuck it back together. Smith is currently exhibiting his Rembrandt's Ruff Ryders series 1-10 at this years Art Basel, Miami with Lawrence Alkin Gallery located at Scope Art Fair, Miami Beach on booth D19. Proper Noun: (1606–69), Dutch painter. Full name Rembrandt Harmensz van Rijn. Noun: A projecting starched frill worn round the neck. Characteristic of Elizabethan and Jacobean costume. Noun: A person rydin’ a motorcycle dirty. Popularised by DMX’s 1998 Ruff Ryders’ Anthem. On the evening of Wednesday 15th November 2017, Christies New York auction house opened bids for the last remaining Leonardo Da Vinci painting available in private hands, Salvator Mundi. After 20 minutes of bidding it achieved an eye watering auction price of $400,000,000. 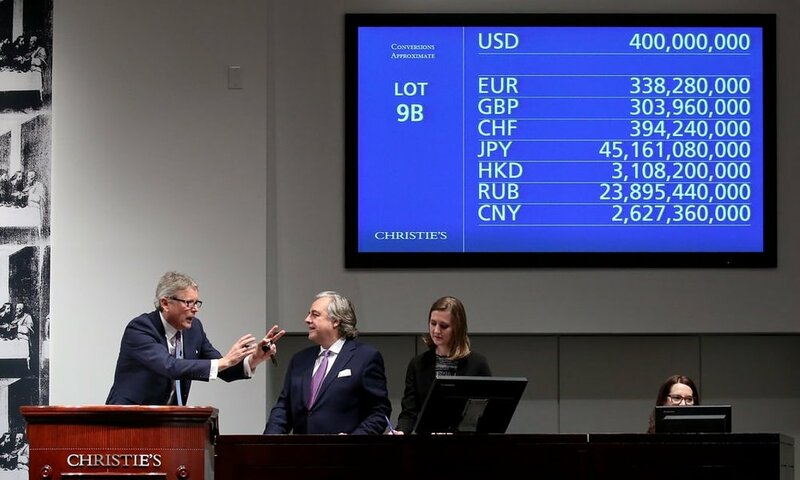 When combined with auction fees the buyer had to stump up another $50,312,500 bringing the total sale price to a world record breaking $450,312,500. 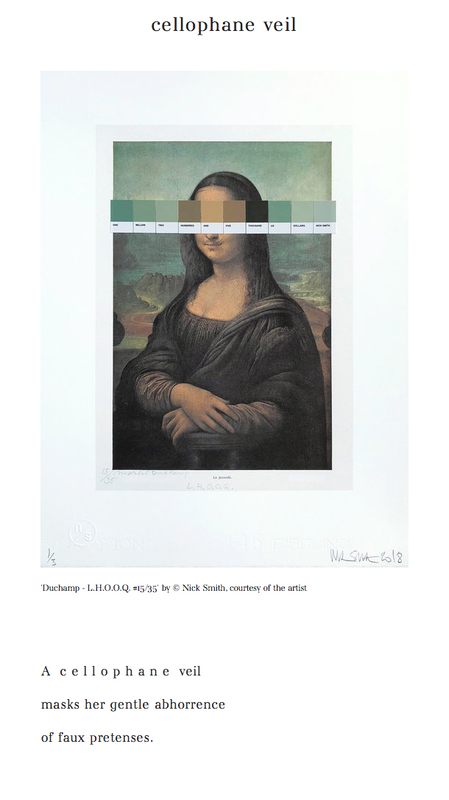 In an attempt to quantify this immense sum of money Smith reinterprets Da Vinci's painting at the exact same dimensions in his signature style, resulting in 509 individual colour chips each having a proportional value of $889,945 and 65 cents. A few months ago, Nick was invited to collaborate on a project with world renowned makers of fine Scotch single malt whisky, Macallan. Today marks the first day of this project being shared online. Over the coming fortnight, Macallan and Smith will share with you the importance of subtle colour variations, which create the visual identity of a finely crafted single malt. Macallan wanted to pair with an artist who has a deep understanding of colour and the ability to coordinate this language into beautiful handmade artworks; The choice to work with Smith was an obvious one. Smith was recently asked to collaborate with Skateptych, the Canadian purveyors of fine art skate decks, to produce a limited run of 56 pairs of Canadian maple wood decks. The artwork chosen came from Nick's Paramour show and the piece in question titled 'Intimations' had words taken from John Cleland's infamous, eighteenth century, pornographic novel, Fanny Hill. 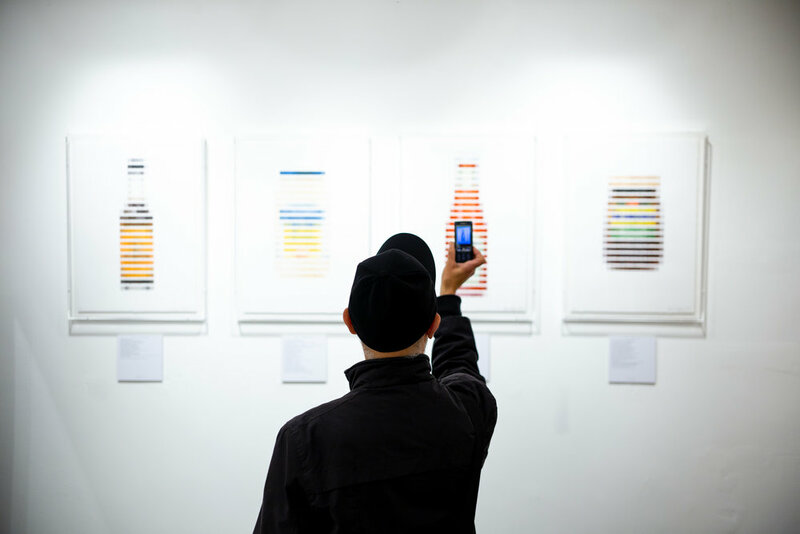 Smith teamed up with Sotheby's Auction House to contribute to their first annual Street Masters collaboration with Fat Free Art gallery in New York. The idea behind the exhibition was to bring together a group of contemporary artists and invite them to reinterpret classical artworks from Sotheby's Master Painting auction on 8th June in New York. Smith's piece sold on the opening evening. "After conducting research into the artwork I chose to reinterpret, I discovered that two brothers are credited with its creation, Agnolo and Donnino del Muzzier. The older brother Donnino was largely unnoticed but tax records showed that he was the brother who recieved the payments for the two brothers joint enterprise, while the younger brother, Agnolo was recognised as a talented artist who conducted much of the work. This imbalance between work and payment led me to parallel the situation with a story penned by the Brothers Grimm, called The Two Brothers. One brother is a rich goldsmith and the other is a poor broom-maker. The broommaker had two identical twin sons. One day, the broommaker saw a golden bird in the woods, knocked off a feather, and sold it to his brother for a great sum. He pursued the bird again and found a golden lamp. A third time, he brought back the bird itself, and his brother, who knew its powers, that whoever ate its heart and liver would find a gold coin beneath his pillow every night. He had his wife cook it. But his nephews came to the kitchen to beg, and when two bits fell from the bird, they ate them, and the gold coins appeared beneath their pillows. The story goes on... Having felt that there was a synergy between the two sets of brothers I have traced the story through the artwork word by word under each individually applied colour swatch. As a result close up reading is a must."